In the simplest possible terms, HDR video lets you watch movies with a broader range of colors than before. While you either have to have an enormous TV or sit very close to the screen to notice much difference with 4K video (as I explained in “Apple TV Finally Enters the 4K Realm, but It Will Cost You,” 12 September 2017), HDR is a more striking change, and one that doesn’t require a TV the size of Texas. If you want to see what HDR looks like without trying to set it up on your TV, you can view 4K HDR iTunes video content on an iPhone 8, iPhone X, or 2017 iPad Pro (see “HDR Movies Now Available for 2017 iPad Pro Tablets,” 16 September 2017). But for the big screen experience, you’ll need an Apple TV 4K. That’s when the problems start. You may go to enable that setting and… it’s not available. Or maybe you force the setting and weird things start happening: your Apple TV slows down, you get weird sparkles on your TV, odd bands of color, or the screen just freezes. As you can see in the photo, that’s what happened to me, and here’s what you can do to try and fix those issues. An Apple TV 4K. The older fourth-generation Apple TV will not display HDR. A television that explicitly supports HDR. 4K TVs often support HDR, but not always, so check carefully. A “high speed” HDMI cable. For years, I’ve said that an HDMI cable is an HDMI cable. That’s no longer entirely true. For HDR, you’ll need what’s known as a “high speed” HDMI cable designed for the high bandwidth requirements of 4K resolutions, 60 Hz refresh rates, and HDR color. The good news is that high speed HDMI cables are cheap: I bought one for $6.99 on Amazon. However, a lot of people swear by the $29.95 Belkin HDMI cable sold by Apple. I might try it as a last resort, but I don’t think it’s necessary. When checking your TV’s specifications, note that there are two main HDR formats: HDR10, which is more widely adopted, and Dolby Vision, which is visually superior. A TV that supports Dolby Vision should also support HDR10, but not vice-versa. For instance, my 2015 Sony supports HDR, but only via Android apps that run on the TV itself. That’s because its HDMI ports are HDMI 2.0, not HDMI 2.0a, which is the minimum requirement to transmit an HDR signal (HDMI 2.1, of course, also supports HDR). As it turns out, one of my Sony TV’s updates fixed this, though the community isn’t sure which one it was. The only way I discovered the change was by stumbling across Settings > Picture & Display > Dynamic Range while looking through my TV’s settings one night. It pays to explore your TV’s settings every so often. You also need to make sure that your content supports HDR. In the iTunes Store, this is easy to see in a movie’s listing. Look for the 4K icon — the one next to it will say either Dolby Vision or HDR if the film is available in HDR. But if the content is in Dolby Vision and your TV can do only HDR10, does your TV display some HDR or does it ignore that data completely? I don’t know. Apparently some TVs can translate between the formats, but it’s a murky issue. Generally, you can expect newer movies from major Hollywood studios to be in 4K and some sort of HDR. The notable exception is Disney, which isn’t yet releasing its videos in 4K. Also note that you won’t have to pay anything extra for 4K or HDR in iTunes, and iTunes will upgrade existing HD movies for free once the studio upgrades the underlying content. Finally, keep in mind that you need to have a fast Internet connection to stream HDR content. Apple and Netflix both recommend 25 Mbps or more of downstream bandwidth. Check Your Apple TV Settings — Once you have the right TV, the right cable, and the right content, you need to make sure that HDR is enabled on your Apple TV. For that, head over to Settings > Video and Audio > Format. What you see is based on what your setup will support. Ideally, choose 4K Dolby Vision 60 Hz here, though 4K HDR 60 Hz is a close second place. If you don’t see even 4K HDR 60 Hz, you can usually scroll down to the bottom, choose Other Formats, and select it from that list, but doing so will likely cause the aforementioned problems. But I immediately noticed sluggish performance — unusual for the Apple TV 4K — and my wife complained about it “going nuts” when I wasn’t there. Over time, I too noticed various glitches and artifacts. If that sort of thing happens to you, go to Settings > Video and Audio and choose Check Cable. That runs a test to see if your current HDMI cable can support the display settings you’ve chosen, and it will set your Apple TV to output the best quality it detects. Alas, running this test always set my Apple TV back to 4K SDR 60 Hz — SDR stands for standard dynamic range. The eventual solution turned out to be related to my TV settings. After much fussing, I finally solved all of my HDR woes by going to Settings > External Inputs > HDMI Signal Format on my Sony TV set and changing the HDMI ports from Standard Format to Enhanced Format. After doing that, everything worked great at 4K HDR 60 Hz, and it passed the Check Cable test. Good news for fellow Sony TV owners: the upcoming tvOS 11.3 update will reportedly add support for Dolby Vision for Sony TVs. My pal John Martellaro at the Mac Observer cleared up his HDR issues with the tvOS 11.3 beta (poor John struggled as much as I did — not even advanced science degrees and time at NASA can help you with today’s TV problems). But for now, 4K HDR 60 Hz is the best I can do, and I don’t even have an option to try to force Dolby Vision. If you want to push the envelope for a smidgen of extra quality, on the Apple TV 4K, go to Settings > Video and Audio > Chroma (if it’s available), and set it to 4:2:2 instead of the default 4:2:0. RTings has a decent explanation of what this does, but in essence it means less compression and thus a theoretically clearer picture. But Now Everything Looks Weird! — You’ve enabled all this stuff and now things look strange. Part of it is the HDR look, which can take a little getting used to. But by default, the Apple TV 4K makes everything HDR, and it also displays everything at the highest possible frame rate. HDR conversion makes for unusual colors and even artifacts, and forcing a high refresh rate causes what’s often called the “soap opera effect,” where everything seems to move just a bit too smoothly. Fortunately, the Apple TV 4K offers a fix for these issues. Go to Settings > Video and Audio > Match Content and turn on Match Dynamic Range and Match Frame Rate. The only downside of this setting is that you may see a brief black screen whenever the Apple TV switches formats, but if you have a high-speed HDMI cable and everything is working properly, you likely won’t notice it. For more helpful Apple TV tips, check out “Take Control of Apple TV,” which I’ve updated for the Apple TV 4K and tvOS 11. While watching known HDR movies from iTunes, I swipe down on the Siri Remote’s touchpad to reveal movie details. I see a 4K icon, but not HDR or Dolby Vision. I’ve asked friends what they see, and I know for a fact that it will display an HDR or Dolby Vision icon when enabled. 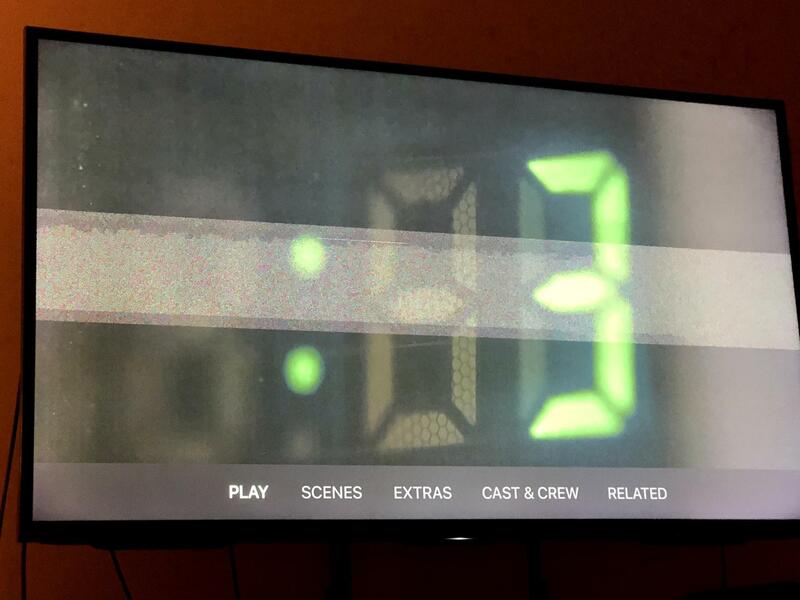 When I press Display on my TV’s remote, I see the 3840×2160 4K resolution displayed, but nothing about HDR or Dolby Vision. Nor do I see anything in my picture settings like other Sony TV owners report. So, although the picture looks outstanding, I can’t tell you for sure that my Apple TV 4K is actually displaying any form of HDR. I’ll be curious to see if the iOS 11.3 update changes anything. TV should not be this complicated. Even years ago, when I had to help my dad adjust the outdoor antenna to watch “Married with Children” in the early days of Fox, what we were doing made some sort of sense. This HDR nonsense is just indecipherable. I’ve been emailing friends who have contacts throughout the industry, and everyone is as confused as I am. And I literally wrote a book in this space! It’s not entirely Apple’s fault. The TV world has long worked like this, with numerous incompatibilities between TV sets and peripherals. But Apple could solve all of this by making a television. Imagine: no calibration, no special settings, nothing to twiddle with! Just sit down and watch TV in the best possible quality. Sure, it wouldn’t be Apple’s most profitable business, but neither is the current Apple TV. Until that day comes, I’ve seen my family relying more and more on my Chromecast Ultra. It has no interface, and no settings as such — it just works. Best of all, it’s voice controlled when paired with a Google Home smart speaker. Nothing delights my son quite as much as saying “OK Google, play PJ Masks,” and seeing the TV coming to life with his favorite show. It’s magical. Hmm, something magical that just works… that sounds like the products our favorite fruit company used to produce. TV Manufacturers really do mess up their port capabilities. When I last purchased a TV (2013), only Sony provided a TV that would transmit anything better than stereo sound from devices connected via the HDMI ports. As a consequence, my TV HDMI ports are almost useless. My disc player, DVR, streaming devices, etc, all need to connect through my A/V receiver. Sooo like many things Apple, it works perfect with the latest gear, but could be tricky with older stuff. I have a brand new LG OLED, apple TV plugged directly into the HDMI port (not through receiver), and a high quality Sony 4K rated HDMI cable. Everything is perfect, everything works great, never had to set up anything it all just works. It costs more, but so would an official Apple brand TV. Being a long Apple user , programmer etc. I have to admit That Apple and Sony are both hardware companies, Apple makes also the software that leads (mostly) to a smooth experience. Even Jobs wal looking Sony, sony never made it easy for Apples. Having a recent LG connected to my 4kK ATV, with just a few (not so obvious, but reasonable) settings, I can start shut turn the proper input control the volume all from ATV remote. This works vice-versa. Ican use the LG TV remote to control the ATV if I loose it in the couch. Magical enough? This is the way things should work even in an Apple made TV. PS BTW Dolby Vision is declared by ATV at the corner of TV screen as soon such a program starts. I have also found that a movie’s icons can be misleading, if you got the movie via Movies Anywhere. Unfortunately, even if Apple makes a TV it won't solve these kinds of issues. Television, as a viewing medium, has been on a trajectory of constant change in the consumer world since the advent of ATSC digital broadcasting, and the demise of the CRT display. Some of this change brings worthy improvements, some is just a way to sell more products, but all of it has unleashed a level of complexity that even us video engineers find troublesome! Apple products have their own technology problems, but the inherent complexity of HDR, HDMI, HDCP, 4K/UHD, surround audio, etc. are not Apple's fault. BTW, I would contend that the "soap opera effect" is not about refresh rate. It's when "features" designed to remove motion judder and blur discombobulate the 24frame cadence of video shot on film, making it look "flat" and harsh--in addition to screwing with the motion. The reference is to a time when most TV was shot on film, until soap operas started being shot directly on videotape. Still on HD, original 4th gen Apple TV, happy with no issues. Not interested in videophile specs; it's not worth the trouble given the improvements are not noticed by most people. Save yourself the trouble and just enjoy what you have.